The Wisconsin State Law Library congratulates May graduates of Wisconsin's law schools. In the legal profession access to information can mean the difference between success and failure. Our library card will help you to access information which will prove invaluable as you begin your new careers. All Wisconsin licensed attorneys are eligible for a free library card. Cardholders can borrow books from the David T. Prosser Jr. State Law Library in Madison and our two other locations: the Dane County Law Library in the Dane County Courthouse and the Milwaukee County Law Library in the Milwaukee County Courthouse. Most items can be checked out for a one week loan. For card holders who are not able to visit us because they are practicing in other parts of the state, we offer a Borrow by Mail service to ship books to your office. Cardholders are also able to access a number of online databases by logging in with their card number: HeinOnline (with some restrictions), Index to Legal Periodicals, and several others. Visit our website and, if you are in Madison or Milwaukee, stop in and see what we have to offer. Call our reference line at (608) 267-9696 for help finding information - there is a good chance we have answered a similar question. 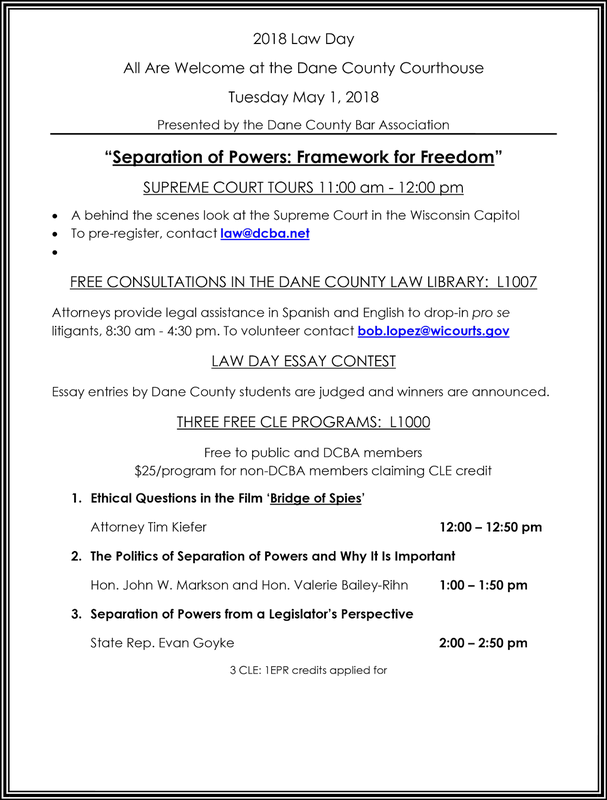 We are the library for Wisconsin's legal professionals. Join us by applying for your free library card. The following information on The Coogan Act was included as part of our library displays during National Library Week as we celebrated "The Art of Law." When he turned 21, Coogan was informed that he had no right to the fortune he had amassed as a child – California law provided that “the services and earnings of [a] child” were the property of his parents. Coogan sued. His lawsuit was marginally successful. He won a settlement against his parents, but the money seemed to have disappeared. His efforts, by his own account, netted $35,000. Coogan’s movie career stalled. He believed his stepfather Arthur Bernstein, who was related to a number of film executives, had engineered a studio blackball against him. He joined the Army during World War II, serving with distinction as a glider pilot. Coogan resumed his acting career after the war, primarily on stage and television, appearing in numerous productions and many different TV series. He is probably best remembered today for his role as Uncle Fester in the 1960s comedy series, The Addams Family. Coogan retired from acting in 1975, and died in 1984. Public indignation over Coogan’s plight led to legislation in the State of California to protect child actors and other minors who may sign lucrative employment contracts. Free legal consultations for self-represented individuals are offered in the Dane County Law Library from 8:30 a.m. to 4:30 p.m. Assistance will be provided in English and Spanish. The following information on U.S. v Paramount was included as part of our library displays during National Library Week as we celebrated "The Art of Law." The Sherman Anti-Trust Act was one of the most notable federal laws of the 19th Century: "Every contract, combination in the form of a trust or otherwise, or conspiracy in restraint of trade or commerce among the several states, or with foreign nations, in hereby declared to be illegal." This law resulted in a fundamental restructuring of motion pictures. The motion picture industry had avoided anti-trust actions for decades. From 1915, it had been the subject of periodic attention from the Unites States Justice Department. Major studios flirted with "vertical monopoly," a control of the commercial process from beginning to end. Studios cultivated a web of contract practices and ownership combinations that placed a strangle-hold on the motion picture exhibition business. In 1938, the Roosevelt Administration brought charges. The studios successfully negotiated a consent decree that suspended litigation in 1940. The Justice Department renewed the charges in 1944. In 1946, a federal court under Judge Augustus Hand ruled for the government, ordering the institution of a competitive bidding process for the right to exhibit major studio productions. The government appealed, seeking an order of divestment. In 1948, the Supreme Court, in a 7-1 decision written by Justice William O. Douglas, threw out the bidding scheme as involving the judiciary too intimately in business management and remanded the case to the district court to find another remedy. With its bidding scheme rejected, the district court began the process of seeking the best way to compel divestment. The Federal Communications Commission (FCC) resolved the case. The FCC adopted a policy that applicants for television broadcasting licenses must be free from any taint of monopolistic tendencies. Several of the major studio defendants in the Paramount case were eager to enter television broadcasting. In order to present "clean hands" with their applications for TV licensing, these defendants dropped all opposition to Justice Department demands and quickly divested themselves of their movie theater holdings. Deprived of a certain market for their films, studios cut back substantially on the number of features they produced; at the same time, television cut in to the average American's movie attendance. There is still some debate over whether or not the case of U.S. v. Paramount was a success as an anti-trust action, but it resulted in changes in the motion picture industry. WILLIAM O. DOUGLAS Wrote the majority opinion for the US Supreme Court. Longest serving justice in the history of the Supreme Court. AUGUSTUS HAND Presiding judge at the district level; cousin to the famed judge/philosopher Learned Hand. TOM C. CLARK Attorney General, argued the case for the United States. Later justice of the US Supreme Court. Father of Ramsey Clark, Attorney General in the Johnson Administration. JAMES F. BYRNES Counsel for 20th Century Fox. Former US Senator from South Carolina; former Supreme Court Justice; former Director of the Office of War Mobilization; Secretary of State in the Truman Administration. JOHN W. DAVIS Counsel for Loews, Inc. (MGM), argued the case for the defendants. Democratic nominee for President of the US, 1924. WILLIAM J. “WILD BILL” DONOVAN Counsel for Radio-Keith-Orpheum Corp. (RKO) Director of wartime Office of Strategic Services, considered the "father of the CIA." Doty St. is scheduled to be closed from April 18-22 for construction work between Martin Luther King Jr. Blvd and Pinckney St. Doty St. will remain open with two way access from Martin Luther King Jr Blvd to the entrance of the Block 89 parking garage. Keep up with construction updates on the City of Madison Judge Doyle Garage construction page. Join us at our open house on April 10th. Enjoy refreshments, get a personalized READ bookmark, and take a tour of historical art in our library at 1 and 2 p.m. We're looking forward to seeing you! Tuesday, April 10 from 1 - 3 p.m.
Art tours at 1 p.m. and 2 p.m.
Tuesday, April 10, Noon - 1 p.m.
Navigate the Court System's website and find the information you need. Learn how to access Circuit Court records, find mandatory forms, search Supreme Court and Court of Appeals opinions, and check appellate case status. Explore additional resources such as the Self Help Center and court administrative office pages. Wednesday, April 11, Noon - 1 p.m.
Get to Know the Lexis Advance platform; formulate search queries; find primary and secondary sources; Shepardize; review delivery options and more. The April issue of WSLL @ Your Service is now online. As always, your comments are welcome. Please direct them to the editor, Carol Hassler.